Thanks very much for all your recommendations and Mousie, I'd love the name of the resto you recommend because I booked an appart in the Trastevere in the end (or within a stone's throw). 450€ for a 2 bed appart between 4 of us so not too expensive at all, and the owner is going to book a car to and from the airport for us as we are flying Ryanair so the airport isn't within easy reach. Training for the marathon has already started and I can't wait, both to do the race and to see Rome. Would love to have the name of the restaurant that is recommended so hopefully the next time I get a chance to go to Rome I can try it. I've wanted to stay in Trastevare and would love to hear how you like it when you get back! It is rustic food, done well, at a good price. One martini, two martini, three martini floor! If you have time go and see the Villa Borghese....such a wealth of art and history. Good luck LV and enjoy Rome, it's lovely. If there's no such thing as co-incidence, then why is there a word for it? Enjoy! I love Rome! would love to hear where you stay and how you like the restaurant, etc... when you get back. Back home now, and we had a wonderful time in Rome. The weather was good (except for race day on Sunday) and having ran past most of the sites during the marathon in the rain we were able to visit them properly on Monday and Tuesday, well, a few of them at least. I think you need a week at least to do Rome justice! I can highly recommend the Trastevere district for staying in. It is very lively, and the only place we saw washing hanging across the street balcony to balcony. It felt really Italian and the food is much cheaper and better than the tourist traps in Ancient Rome. And only a 15 minute or so walk from the Vatican city. We looked for Mousie's restaurant and found the street but not the restaurant in the end, so I'm afraid I didn't visit it but we did try. 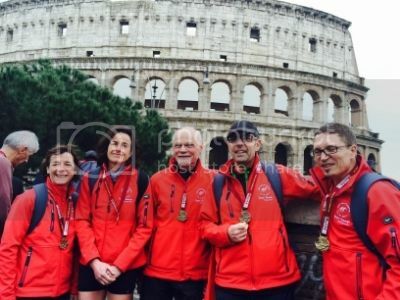 Despite the Italian's not so great reputation for organisation, the marathon was organised exceptionally well and was a great event to take part in as the course starts and ends at the Colisseum and goes through and past many other monuments and squares. If anyone is interested in running my time was 3H41M, 185th woman out of 2500 and 2922 out of 11500 runners overall. 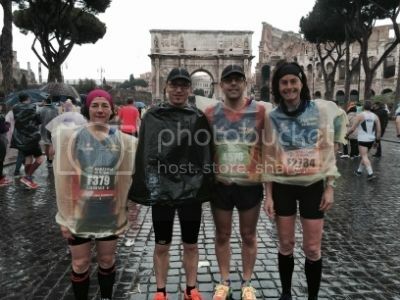 It was my first one (a goal before reaching the big 5-0 later this year) and I really enjoyed it despite the bad weather conditions - running on wet slippery cobblestones isn't ideal! Well done - that's a really decent time for your first marathon. Bravo!! Amazed at your time, especially as I've passed the 5-0 mark and am heading for the 5-3 mark....and there is no way I could do what you did even if there weren't cobblestones! Too bad you didn't find the restaurant, did you stay in a hotel or an apt you could recommend in Trastevere? So glad you had a good time, LV. And did a good time too though I know so little about running that I wouldn't know a good time from a bad one! Although I'd have no problem walking the same distance anyone who runs it deserves a very large chapeau! That is an excellent time for your first marathon; you can only get even better!! Did you get to see the San Clemente church? @Pambon, we saw an awful lot of churches, but I'm not sure we saw the San Clemente one. Where is it? @Wendy - our appart wasn't actually in Trastevere, but the next district (despite being advertised as Trastevere). It was cheap, clean and good, the owner couldn't do enough for us and the area was residential and quiet, but I think if I went back I'd definitely stay in Trastevere itself. Great photos! I'm going to Rome in the fall with a friend and looking for clean and cheap! if you have a link can you post it?